This week we're going on the first vacation my entire family has ever taken together. Grammie moved to Georgia, which means my kids finally have their grandparents all in one state. I'm caught up on my work (okay, mostly) and halfway through the first draft of my new book. My husband was recently promoted and started his new position. It's been a good week. It's been over a week now since this happened, and still I'm stunned. These people were the center of the GoT universe (at least on the HBO version), and now they're gone. I should've known George R.R. Martin wouldn't let anyone be happy for too long. He and Joss Whedon have that in common. But what they also have in common is great storytelling. Yes, I'll miss the Starke family. Yes, I was horrified to watch a pregnant woman stabbed right in her belly, especially since three months ago I was pregnant myself. And yes, I've watched the episode twice more in the vain hope that it will end differently. At the same time, I know it's the right move. That episode will stick with GoT fans forever, just like its literary version has stuck with readers. And isn't that what we're all trying to accomplish? Writers want to affect their readers, to make them feel something, to stick in their minds for a long time to come. 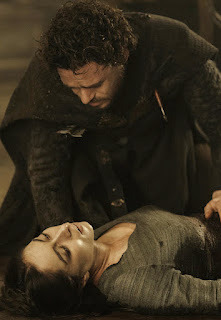 And I definitely felt something when I watched the Red Wedding on TV. Eventually I'll be reading the books as well, to experience the original version. I'm haunted by it. Writers killing off beloved main characters...that's brave. And difficult. But sometimes it's right. We should all aim for that level of intensity. Killing our darlings is hard work, but sometimes it must be done. Now the season is over. No more GoT for nearly a year.